I can never say no to a stripe shirt. Always a classic. I matched this one up with a textured knit and slouchy trouser. Also finally taking my little bucket bag for a spin. Hello little bag baby 🙂 Hope everyone is having a great week. Natali - Superb outfit! 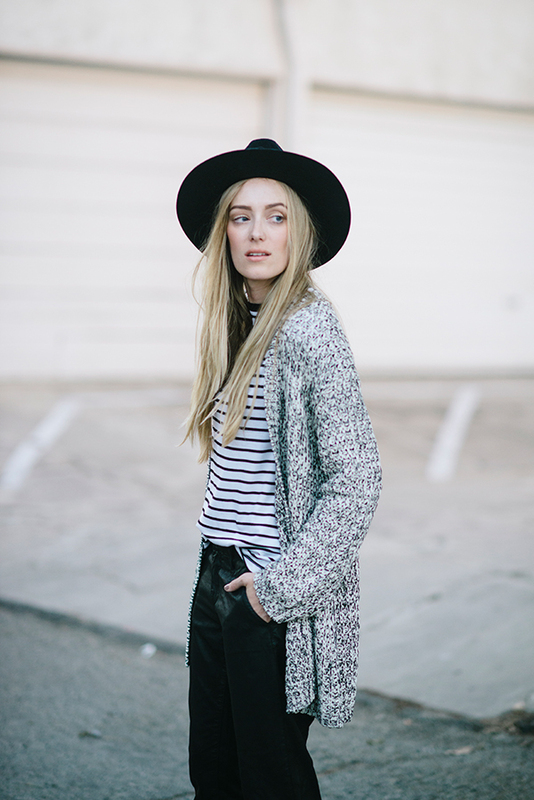 Love your cardigan and hat! Anja - The real fall outfit, I like it very much! Blue Labels Boutique - Nice outfit! Love the sweater and the bucket bag! Gap - Great look, you master stripes! Erika - Love this look! those boots are so nice! nikki - i love that sweater! so cute + comfy! Fashion Snag - Love this look! 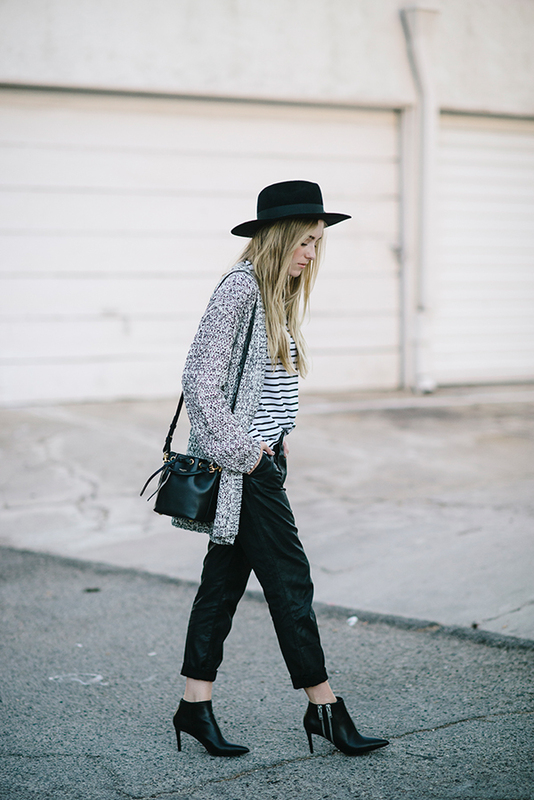 Camille Freestone - Love the mixing of the black and white prints! And those pants are so cool, especially with your fabulous shoes! Shae - I can’t turn down a good stripe either! I’m loving this one with your marled-looking sweater. Avan - Oh la la…have a weakness for striped Tees as well! A great alternative to your sweater is this little find by Johanne Rubinstein : http://www.trovea.com/johanne-rubinstein/cottan-sweater.html … you like? Melissa - Love that bag! Eye Like Fashion - Laid back chic. Jeanne - How cool and inspiring! Love the boots and the cardie! Renfashionista - Love that deep hunter green color! Fabulous shoes and purse! Super! Michelle Lee - great boots and cardi! Blue Labels Boutique - Love the top! 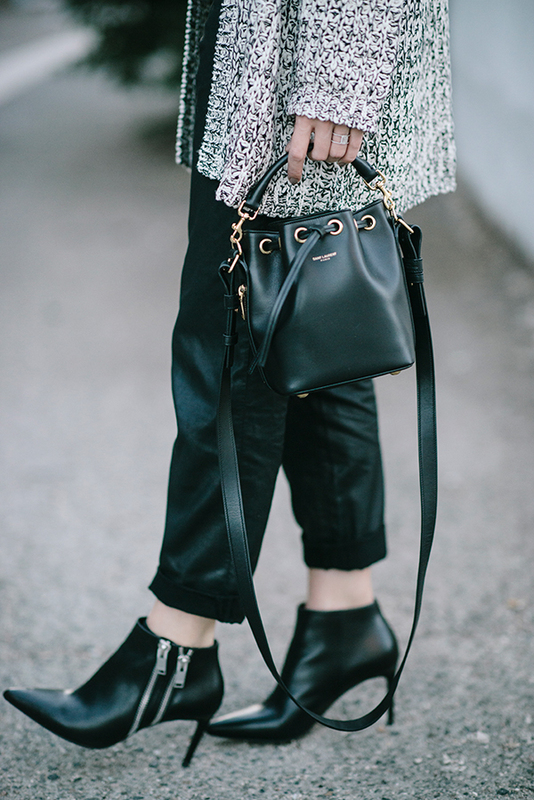 Fashion and Frappes - I am not a fan of bucket bags but really liked this one! Its small and very elegant. Also, love the double zip details on those boots. Daphne Blunt - Mini Saint Laurent bucket bag! SO CUTE!